…even though I’m under the average age of UK cruiser. But let me tell you why I think younger people, groups of friends or couples especially should give cruises a try. 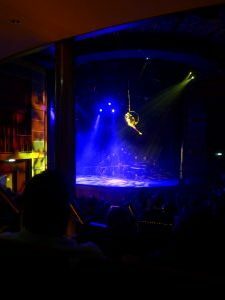 Recently a fellow travelblogger Travelshopgirl shared a blog post by another blogger under the name of Wanderabouts called ‘The Top 10 reasons why we LOVE to cruise‘. 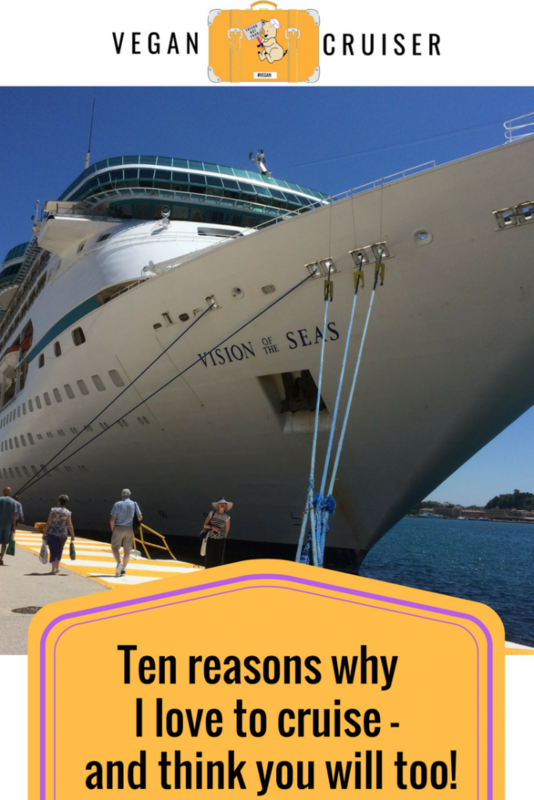 It caught my eye and must have done the same for Travelshopgirl as she proceeded with her own ‘top 10 reasons to cruise’ post. 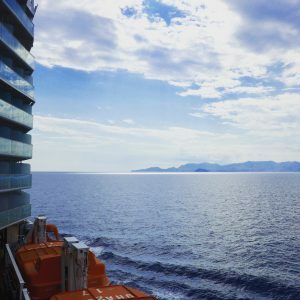 That prompted me to write my ten – but I could probably write a lot more  And if you are a cruise blogger or a cruise fanatic I challenge YOU to share your own top ten reasons and tag me in your post or tweet – ready, set, GO! On self-catering resort or city holidays we do eat out but do end up doing a lot of our meal prep – which involves going to the grocery store. You take the items to your temporary home, prep or cook them and end up with the dishes to do at the end. Not a hallmark of a relaxing, luxurious holiday – just the stuff you do at home, every day. *we don’t do fully formal (ballgowns, DJ/tux), just smart casual or formal-lite for me. You won’t find us on Cunard ships which rather rigid with their dress code. Celebrity’s Evening Chic is more us or Royal, MSC, Carnival or even Princess. I love being able to visit various ports in many countries over one holiday. It’s a great way to sample places – having spent a day in port in Florence I now know it is both gorgeous and very vegan-friendly, so am looking forward to visiting it later. True, you can visit many places over a holiday but with cruise holidays there is no need to unpack/pack and travel between locations. Instead, you visit many places from one base, your ship. This compared to a resort holiday where you are in one spot a week and after a few days you have seen everything there is. 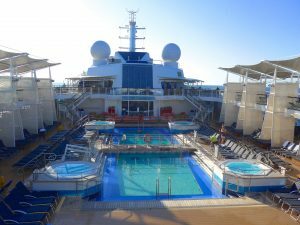 Cruising a convenient way of travelling – not just what I said above but stuff like your suitcases are delivered to your room from the check-in at the port. There is room service. A wonderful cabin attendant who keeps the cabin in order. If only I had one to keep my home as neat during rest of the year! Since I mentioned the lovely (and hard-working) cabin attendants – I must not forget the towel animals they treat the passengers with  This may be childish of me but they do cheer me up. 6) A wide range of dining options on offer – so much choice! 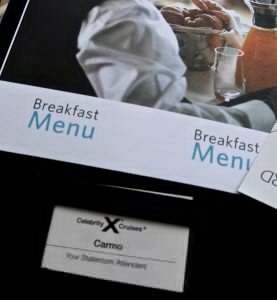 Cruise ships offer a wide choice of foods from all over the world – a range of venues, menus and themed nights. Main dining room, specialty restaurants, coffee shops, ice cream bars, buffet restaurants. Food glorious food – when you want it. You don’t need to do ‘set’ dining unless you want to. 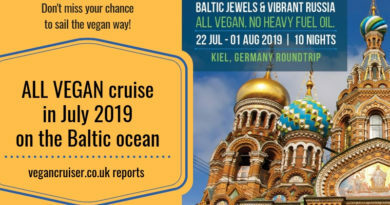 And since we’re on the theme of food – cruise ships are used to catering to customers’ wishes, so dining with allergies/intolerance and related diets not a problem – even vegan food can be found. Princess especially were amazing with their MDR food (desserts too!) and MSC’s Bora Bora buffet was wonderful for vegan choice. 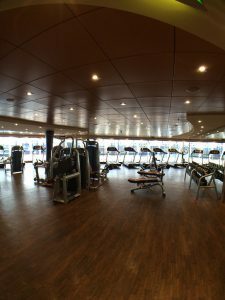 The fabulous views onboard these beautiful ships – so calming. Gorgeous blues of the seas. So mesmerising, so addictive that I think this might just need to go up to be the top reason for me to cruise. 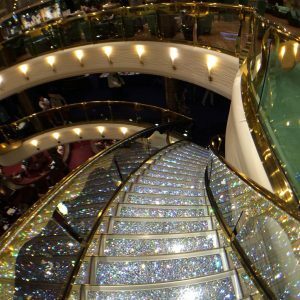 Gorgeous ships, fantastic decor anything from Swarovski stairs to art displays all over the ships, quirky lifts with wanderlust-inspiring messages. 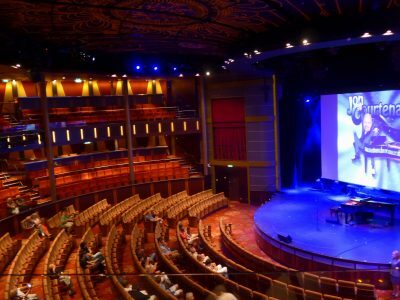 10) Cruise holidays have so much to offer – no place for boredom! 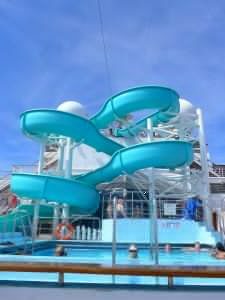 My last post was on one of these cruise spas, have a look here! 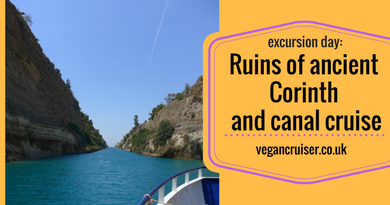 If you like my cruise pictures, follow me on Instagram for more @Vegancruiser  Never miss a post, sign up for my mailing list on the left! That B Boy ‘yo bunny’ is my favourite of all I have ever had  Cheeky! Yes, the kids love the towel animals just like us young-at-heart do too. And you’re right, I have only ever seen staff fuss over children – so pleased you had a great cruise experience with your kids. As someone who started cruising as a baby/ toddler and thru my school years I always felt looked after by the staff and enjoyed my cruises even then. My fave thing to do on a cruise is dresss up for dinner every night! So great for a birthday week. All these pictures look amazing! I’ve only been on 2 cruises, both were group trips and both with Carnival. I didn’t love it lol. But MSC and Celebrity look worth a try! Oh no, why didn’t you enjoy your trips? Sure, some ships are older, some ports more interesting than other… Celebrity is stunning. 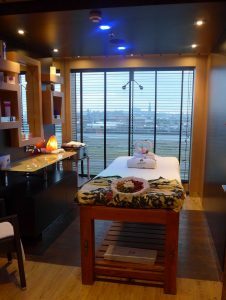 Modern, classy, fab for couples… had a great girlie trip on a Carnival ship though, younger more fun crowd. I love the idea of “testing out” a few different countries all at once. I always have such a terrible time trying to decide where to go next! 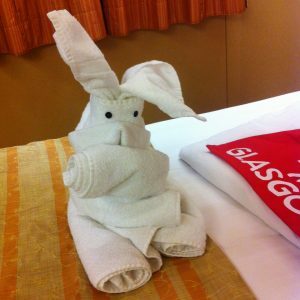 I’d go on a cruise just to see a towel bunny hahaha.